I’ve recently switched from PowerPoint to Keynote. When I printed PowerPoint handouts I was able to put several slides on a page so that each slide took up one quarter of the page. When I print Keynote handouts using the Handout option in the Print sheet, I get four small slides along the left side of each page. How can I print Keynote handouts so they look like my old PowerPoint handouts? I don’t blame you for being confused. In order to do this correctly you have to visit a couple of areas of the Print sheet. First, within the sheet, choose Layout from the pop-up menu. In the Pages per Sheet pop-up menu, choose 4 (or the number of slides you want to appear on each page). Next, click the pop-up menu that now reads Layout and choose Keynote. 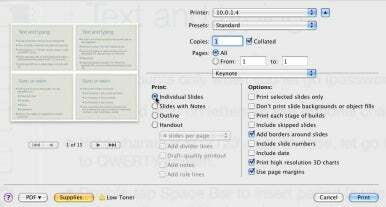 In the Print area of the resulting sheet, select Individual Slides rather than Handout. The preview to the left should display the neatly organized layout you’re after.